Manuel Delia near the Daphne Caruana Galizia memorial in Valletta. 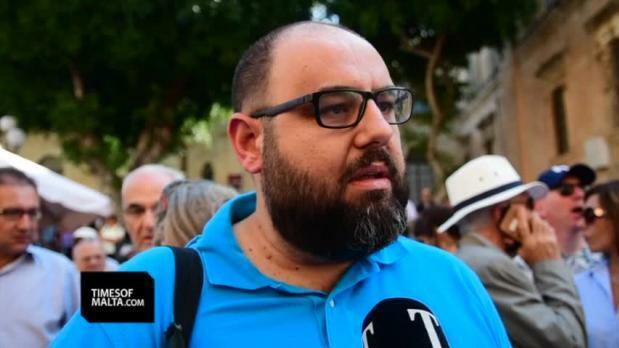 Activist and blogger Manuel Delia said on Tuesday that he was perplexed at how his direct interest in a court case over the removal of candles and banners from the Daphne Caruana Galizia makeshift memorial in Valletta was being questioned. Mr Delia had instituted the case against Justice Minister Owen Bonnici, claiming a breach of his freedom of expression. On Thursday, the minister's lawyers argued that other people, rather than Mr Delia, had personally placed mementoes at the Great Siege monument, which is being used as the Caruana Galizia memorial. Mr Delia in his reaction on Tuesday, said he had never expected to have to prove that he actually protested in front of the Great Siege memorial, and the lawyers' reaction “lacked all trace of truth, logic and practicality”. Referring to his sworn affidavit presented in the acts of the case, Mr Delia cited salient parts where clear reference was made to his presence at the protests and the placing of items at the memorial. He could not understand how the minister's lawyers had reached the conclusion that such items had only been placed by other people, basing their arguments on the testimony of Dr Karol Aquilina and Ms Ann Demarco, when he too could produce evidence showing he had actually paid for the banners at the memorial. Moreover, he had participated actively in the protests and had in fact been acknowledged as the lawful owner of the items which, after having been removed from the memorial, had been returned to him under police instructions. Lawyers Therese Comodini Cachia, Eve Borg Costanzi, Jason Azzopardi, Karol Aquilina and Paul Borg Olivier are counsel to Mr Delia. Lawyers Victoria Buttigieg and Chris Cilia are counsel to the respondents.